NB: These products were sent to me free of charge in exchange for an honest review. All thoughts are my own. For more information, click here. A little while ago, I was contacted by a rep from the company Neocell about trying some of their products. Looking up the company, I found that they primarily market collagen and other dietary supplements, so I politely declined, as I already have a supplement regimen in place and am not in the market for others. When she mentioned that they also sell topical products, I was intrigued, and agreed to test out a serum and a wash-off mask. 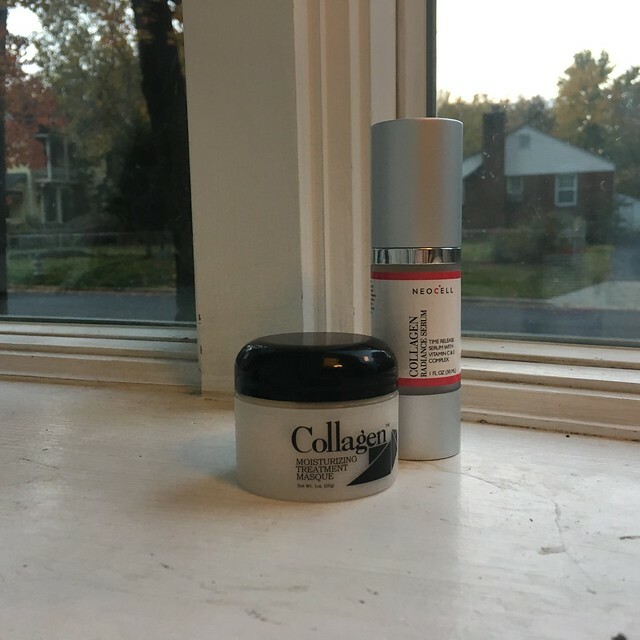 A couple weeks later, I opened my box to find a bottle of Collagen+C Liposome Serum and a jar of the Collagen Moisturizing Treatment Masque. The serum was in an airless pump, similar to the type of pump used by Makeup Artist’s Choice for their serums, while the mask came in a small jar. I tested the serum for a few weeks, while I only tried the mask once. Unfortunately, my (unrelated) skin freak out happened toward the tail end of testing these products, but I still feel like I’ve gotten a sense of how I like them. The Collagen+C Liposome Serum is a translucent gel serum that contains soluble collagen, vitamin C (in the form of ascorbyl palmitate), amino acids, and vitamin E. While the exact percentage of ascorbyl palmitate is not stated, there is research that ascorbyl palmitate in topical preparations can have some of the same benefits of ascorbic acid, while being less sensitive to pH. Therefore, I do not worry about a wait time after this serum. There is actually limited evidence that collagen in topical preparations has much benefit beyond retaining hydration. So I did not go into this test with high hopes, to be honest. But I found that after replacing my COSRX Triple-C serum with this for two weeks, I did not notice new breakouts, and noticed my existing lingering marks fading nearly as quickly as they had been. While I would not buy this again for myself, it is a simple serum, containing a potentially-effective form of vitamin C, and that doesn’t require worry about pH, all at a very reasonable price, so I might consider suggesting this to a friend or family member who wanted to improve their skin routine without going all-in the way I have. The Collagen Moisturizing Treatment Mask was different. It contains moisturizers and collagen, as well as several essential oils and plant extracts. I personally found the scent a bit strong for me — it smells fairly strongly of sandalwood and patchouli, which are not scents I’m fond of. I also don’t tend to use moisturizing wash-off masks, so I think I applied it a bit too thickly and had trouble washing it off. That said, despite the strong essential oils, this mask did not irritate my skin at all, and I did notice a moisturizing effect after leaving it on for half an hour. So if it were reformulated to reduce the scent, I would consider buying it again. And if you like sandalwood and patchouli, definitely give it a try.